Part of the Guodian Chu Slips: "The Great One Generates Water". Photo was taken in Hubei Provincial Museum. The Guodian Chu Slips (Chinese: 郭店楚簡; pinyin: Guōdiàn Chǔjiǎn) were unearthed in 1993 in Tomb no. 1 of the Guodian tombs in Jingmen, Hubei Province, and dated to the latter half of the Warring States period. The tomb is located in the Jishan District's tomb complex, near the Jingmen City in the village of Guodian, and only 9 kilometers north of Ying, which was the ancient Chu capital from about 676 BC until 278 BC, before the State of Chu was overrun by Qin. The tomb and its contents were studied to determine the identity of the occupant; an elderly noble scholar, and teacher to a royal prince. The prince had been identified as Crown Prince Heng, who later became King Qingxiang of Chu. Since King Qingxiang was the Chu king when Qin sacked their old capital Ying in 278 BC, the Chu slips are dated to around 300 BC. There are in total about 804 bamboo slips in this cache, including 702 strips and 27 broken strips. The bamboo slip texts consist of three major categories, which include the earliest manuscripts of the received text of the Tao Te Ching, one chapter from the Classic of Rites, content from the Classic of History and other writings. 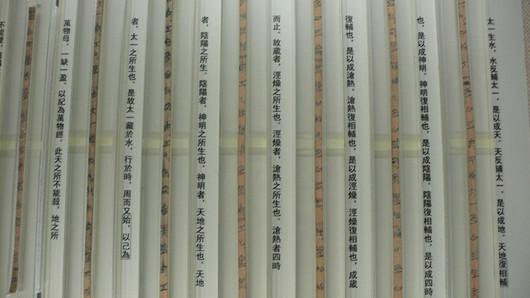 After restoration, these texts were divided into eighteen sections, and have been transcribed into standard Chinese and published under the title Chu Bamboo Slips from Guodian on May 1998. The slip-texts include both Daoist and Confucian works, many previously unknown, and the discovery of these texts in the same tomb has contributed fresh information for scholars studying the history of philosophical thought in ancient China. According to Gao Zheng from the Institute of Philosophy of the Chinese Academy of Social Sciences, the main part could have been teaching material used by the Confucianist Si Meng scholars of the Jixia Academy in the State of Qi. Qu Yuan, who was sent as an envoy to Qi, might have taken them back to Chu. Recent scholarship has questioned the value of categorizing works that date prior to pre-Han as strictly Confucian or Daoist. These categories only appeared during the Han and do not relate in any meaningful way to Guodian. The diversity of views represented in the tomb is a perfect example of the blurring of these lines.